As the weather gets warmer, I thought we might take some time to discuss the importance of your pets' heartworm prevention. 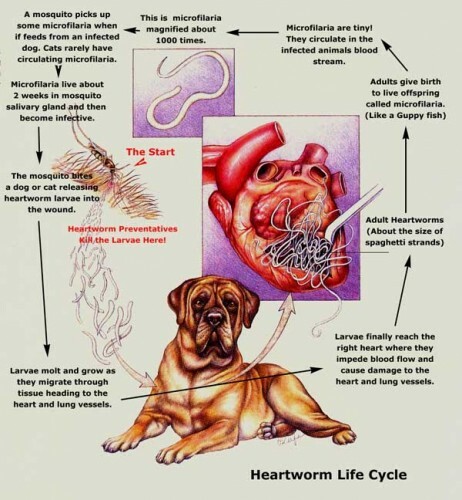 Heartworm (Dirofilaria immitis) is a parasitic roundworm that infects primarily dogs. The parasite can also infect cats and other domestic and wild animals. Heartworms are transmitted through the bite of common mosquitos. While prevention is relatively inexpensive and easy to administer, treatment can be very costly, painful, and dangerous for the animal infected. The heartworm parasite can be found in all areas of the country where mosquitos are present. After an animal has been bitten by an infected mosquito, it can take up to seven months for the parasite to appear in diagnostic screenings. It takes only a single bite for an animal to get infected. In a nutshell, the worms travel though the dog's body as they develop, taking up residence in and around the heart and lungs. As they grow and multipy, they can clog these important blood vessels and cause very serious health problems. Cats can also contract heartworm disease, but it progresses differently and their symptoms are the result of inflammation rather than the obstruction of blood flow as in dogs. While heartworm infection in cats is less common, there is no treatment for the disease. The inflammation can be treated to increase comfort or quality of life, but the cat will always have the parasite. While some dogs will never show symptoms, many will come to the vet for coughing, exercise intolerance or lethargy, or nose bleeds. For dogs with heavy infections, symptoms may include pneumonia and heart failure. Annual testing allows us to find these problems early and begin treatment, helping to prevent long term damage. The treatment for heartworm disease in dogs involves injecting a paraciticide into the dog's muscle in order to kill the adult worms. This treatment can be both painful and dangerous. The dog must have strict excercise restriciton for several weeks after the initial treatment to help its body absorb the remaining worms without ill effect. If the dog is too active, the worms can break loose in clumps block blood vessels causing furthur health problems. Even after successful treatment, permanent cardiac or pulmonary disease may remain. Monthly heartworm prevention not only prevents heartworm infection, it also prevents intestinal parasite infestation such as hookworms, roundworms, and whipworms (depending on which product you choose). Some preventions are even combined with flea prevention to help make life a bit easier. Due to variations in lifestyle, different products may be more suitable than others. Talk to your veterinarian about which prevention is right for your pet.